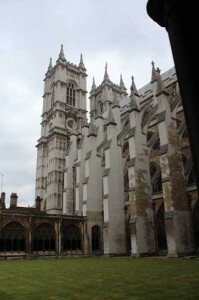 1st June 1533, Whitsun, was the fourth and final day of Queen Anne Boleyn’s coronation events and was the big day: the coronation ceremony at Westminster Abbey. The pregnant Anne Boleyn was dressed in a surcoat and robe of purple velvet, the royal colour, trimmed with ermine and on her head was the coif and circlet she had worn for her coronation procession through London the day before. Anne’s walked barefoot under a canopy of cloth of gold carried by the barons of the Cinque Ports and her train was borne by the Dowager Duchess of Norfolk. Anne processed to the chair of St Edward and then rested for a few moments before making her way to the high altar and prostrating herself for Archbishop Cranmer to pray over her. I can only imagine how uncomfortable she must have been, lying on her front while pregnant. Anne then got up and Cranmer anointed her. She was then able to rest in St Edward’s chair while orations were said. Cranmer then crowned her with the crown of St Edward, a crown usually reserved for crowning the reigning monarch, and placed the sceptre in her right hand and the rod in her left hand. The Te Deum was sung and Cranmer helped Anne exchange the heavy crown for a custom-made lighter version. After the Mass, Anne took the Sacrament and then gave the traditional offering in St Edward’s Shrine. It was then time for everyone to get back in line to process to Westminster Hall for the traditional coronation banquet. As she walked to the sound of trumpets, Anne’s right hand was “sustained” by her father, Thomas Boleyn, Earl of Wiltshire, and her left hand by Lord Talbot, acting on behalf of his father, Earl of Shrewsbury. In Westminster Hall, Anne was escorted to the King’s marble chair where she sat under a cloth of state. Anne was attended by the Dowager Countess of Oxford and the Countess of Worcester, who stood beside her, and two gentlewomen sat at her feet. The Earl of Oxford, as high chamberlain, stood beside her and then Archbishop Cranmer sat next to her. The Earl of Essex was the carver, the Earl of Sussex the sewer, the Earl of Derby the cupbearer, the Earl of Arundel the chief butler and Thomas Wyatt the chief ewer, on behalf of his father, Henry Wyatt. When everybody had taken their seats, Charles Brandon, Duke of Suffolk, and William Howard entered the hall on horseback to announce the first course, which was being carried by the knights of the Bath. Suffolk was wearing a jacket and doublet “set with orient perle” and a gown of embroidered crimson velvet, and his horse was draped with crimson velvet, embroidered with real gold letters, which reached the ground. As was tradition, the King did not join his wife at the banquet, but, instead, watched it from a special “little closet” with the ambassadors of France and Venice. After around eighty dishes, the banquet ended with wafers and hippocras, followed by a break for the Queen to refresh herself and then “a voyde of spice and comfettes”. Then, the Mayor of London gave Anne a gold cup, from which she drank before giving it back to him. Anne then retired to her chambers where she had to go through the formalities of thanking everyone before she could rest. It finished at around 6pm. Phew, what a day! LP vi.583 – Coronation of Anne Boleyn, as reported by Sir John Spelman, one of the King’s Justices who attended. This is followed by a list of materials used for the Queen’s litter, apparel and Goldsmith’s work – very interesting! LP vi.585 – Coronation of Anne Boleyn, From a catalogue of papers at Brussels, now lost. This one needs to be taken with a hefty pinch of salt (perhaps a whole bag? ), particularly “Her dress was covered with tongues pierced with nails, to show the treatment which those who spoke against her might expect” and the mention of her wart and goitre! Talk about propaganda! This account is not backed up by any of the other accounts you’ll be pleased to know but it shows what propaganda there was out there. I take it that the two gentlewomen at her feet helped her out with her napkin and other less mentionable functions? It was a long day, and she *was* pregnant, after all. Yes, that’s right, they were the ones in charge of the kerchief which was held up to shield her face when she needed to spit or wipe her face. What’s funny is that this has been used as proof that Anne was bulimic and that she vomited between each course, when actually it was customary. Elizabeth of York had exactly the same at her coronation banquet. It’s amazing how things can be twisted! Bulimic? Oh lord, and just when I thought I’d heard every possible thing people can come up with :). Who came up with that particular hypothesis? Claire, do you know of any references to Lord Burgh (Borough) while he was Anne’s chamberlain other than that in Letters & Papers vol. VI. 556 (Vienna Archives)? I am interested in him through the research I have done on Norfolk House in Lambeth and his house at Gainsborough. The 2nd Lord Burgh (Katherine Parr’s first father-in-law), helped the dowager Duchess of Norfolk carry Anne Boleyn’s train at her coronation. In his enthusiasm to show his allegiance to the new Queen he appropriated the river barge of her predecessor and had her coat of arms taken off, an action regarded by some of the courtiers as being in very poor taste. Chapuys wrote to Charles V that even though Henry had, according to the Duke of Norfolk, roughly rebuked the chamberlain, Anne still used the barge for the journey from Greenwich to the Tower “the Lady has made use of it in this triumph, and appropriated it to herself. God grant she may content herself with the said barge and the jewels and husband of the Queen, without attempting anything, as I have heretofore written, against the persons of the Queen and Princess”. In hindsight, it is a bit eerie that Anne was pregnant with Elizabeth at this time… fast forward almost 25 years and we have another lavish coronation! It’s almost like Elizabeth went through two coronations! And Elizabeth would have been crowned twice with St. Edward’s crown! Seriously, has any consort, before or after Anne Boleyn, also been crowned with the crown of St. Edward? Esther – yes, consorts before Anne were crowned with the crown of St Edward (Katherine of Aragon for one) but Anne was the last. It was not usual for a consort to be crowned with St Edward’s crown and Catherine of Aragon was crowned with St Edith’s crown. It’s amazing she was able to go through all of this while pregnant! Wasn’t she around 6 months pregnant at the time of this coronation? Interesting it wasn’t put off until after the birth of the baby. I always thought Queens, including Anne, had to be so careful during pregnancy in order to avoid a miscarriage (or so it was perceived during Tudor times). Look how careful she will be with her future pregnancies, after the birth of Elizabeth. Anne did actually complain afterwards that as she came through the city hardly anyone raised their caps or cheered, but she was treated to many pageants so that probably made up for it.